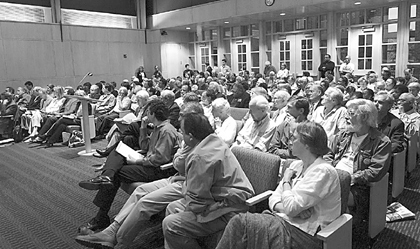 THE ARTS COUNCIL LOBBYS FOR CHANGE: It was standing-room-only at the Princeton Regional Planning Board hearing of the proposed expansion of the Arts Council building. The meeting was adjourned after midnight without a final vote on the application. The Arts Council later released plans that reduce the expansion by 21.4 percent. The next meeting, which will include a public hearing, is scheduled for June 17. In a move apparently bowing to pressure from the Witherspoon-Jackson Neighborhood Association and others, the Arts Council of Princeton has released a scaled-down version of expansion plans. At a special meeting of the Princeton Regional School Board, Hazard, Young, Attea, and Associates. Ltd. was hired to help the district find a superintendent to replace Dr. Claire Sheff Kohn. Dr. Kohn recently resigned to take a superintendent position in the Masconomet School District in Massachusetts on August 1. Princeton Community Housing (PCH) received a nod from the Site Plan Review Advisory Board to move ahead with plans to build 68 additional one-bedroom units at Elm Court, the senior housing complex located on Elm Road.